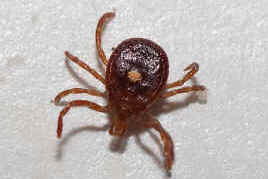 A tiny tick, known as the "lone star tick" for the white spot on its back, just might be responsible for spreading meat allergies on the East Coast, forcing meat lovers to reluctantly give up their carnivorous ways and convert to vegetarianism. The University of Virginia researchers say that saliva that enters the bite wound may be the cause of the allergic reaction to meat. "People will eat beef and then anywhere from three to six hours later start having a reaction; anything from hives to full-blown anaphylactic shock," said Dr. Scott Commins, Assistant Professor of Medicine at the University of Virginia in Charlottesville. Naturally, people want to avoid any food that triggers such a reaction. Cases of this strange allergy, at least 400 already reported, are starting to appear along the East Coast, as well as Southeastern and South Central United States, areas heavily populated with the lone star ticks. Dr. Collins has said that while the link between the lone star tick bite and meat allergies is hard to prove, they're still "searching for the mechanism." Dr. Commins has linked the bite of a lone star tick to a rise in the blood levels of antibodies for alpha-gal, a sugar found in red meat, pork and lamb. Dr. Commins said, "It's complicated, no doubt. But we think it's something in the saliva." Experts say that further complicating matters is the three to six hour delay between the ingestion of meat and the allergic reactions. Dr. Stanley Fineman, President of the American College of Allergy, Asthma and Immunology said, "It's very atypical as food allergies go. Most food allergies occur very quickly. And it's also a bit unusual to see adults develop a food allergy. But the tick bite theory could help explain the sudden onset of some meat allergies." While most food allergy sufferers are happy to rid themselves of their source of suffering, the foreign concept of giving up meat may be hard to swallow for some, so to speak.